I keep some of these relics on my desk. They remind me that there is always something new to be discovered. Imagine what the inventor of these 45 record centers would think of cassette tapes, compact discs, and ipods. New technology aside, even items that have been around longer than 45s have been reinvented over and over again. Need convincing? Step into Sephora and notice the hundreds of ways perfume can be bottled. Pop into a Hallmark and see how clever their Fresh Ink line is. This weekend I took Fallon to an antique store which was more like an indoor flea market. She loves rummaging through all the stuff - old jewelry, vintage clothing, other people's stuff. She was fascinated by a telephone with a DIAL and a handset attached with a CORD. And she tapped away on an old TYPEWRITER. 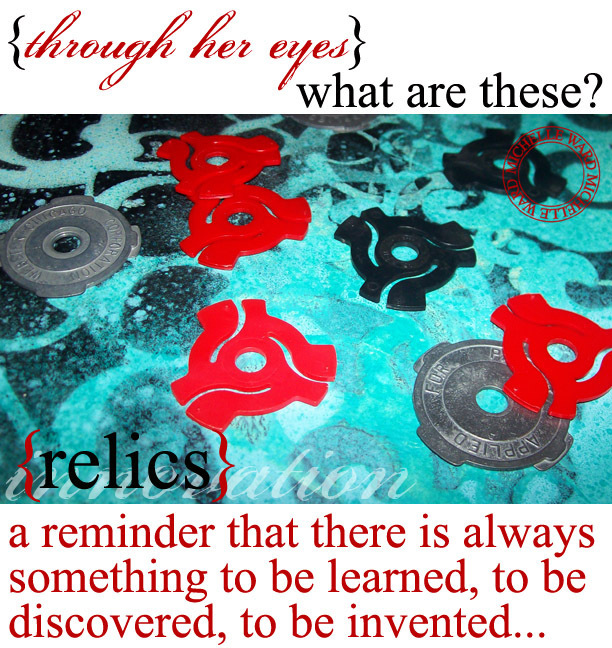 It made me think about my 45 centers....these things she only knows as relics. At one time they were innovations. The day provided an interesting perspective to see the world through Fallon's eyes. When thrifting I rarely look at old books anymore. I have enough piled in this studio and they have fallen out of favor in my work. 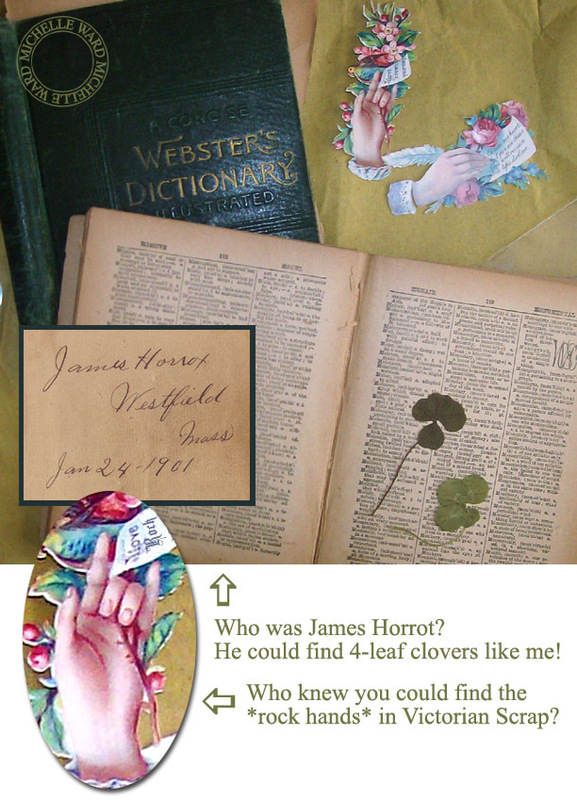 But this little green dictionary got my attention, and my $4, when I saw that it's owner was also a collector of four leaf clovers. Pressed within it's pages were at least a dozen. A kindred spirit. 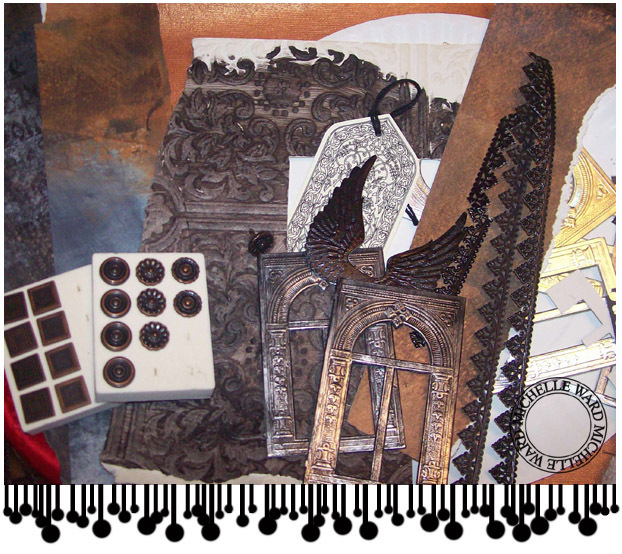 I also have enough Victorian Scrap so I didn't need to finger through the neatly packaged keepsakes except to look for those that had Roses as I'm still infatuated. Imagine my surprise to find one that was *winking* at me....holding up the Rock and Roll horns. Had to have it. HCIT? Not sure where I got this habit of using an asterick ( * ) when writing on my blog or leaving comments. It usually surrounds a verb, like this: *blows kisses* or *scrambles to find a link* or *grins*. I think it evolved from a messageboard I belong to that used to have The Best smilies to include in a reply. 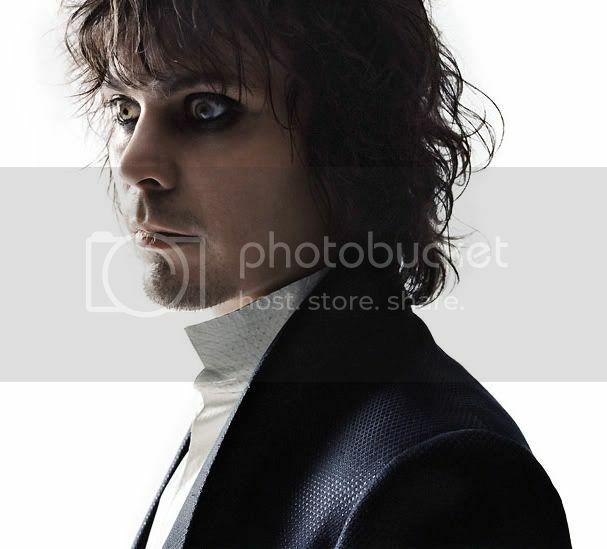 So when the board changed servers we lost the smilies and we had to invent a way to *say* what we wanted a smilie for....like when a new photo of our favorite rock star got posted we would *faint* or *swoon* or *squeeee*. A few days away from my studio makes me crabby. 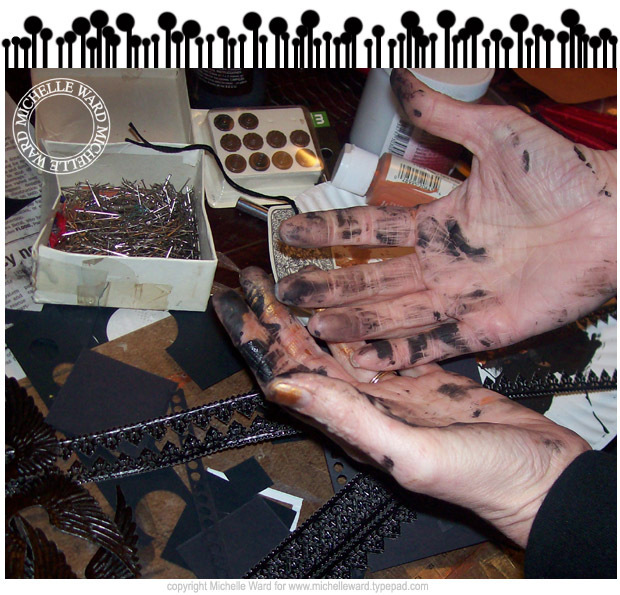 I love when there are so many ideas rattling around that it only takes a nano-second to engage and get messy. Seems like I never get my task completed which is ok because it's ready for me the next morning. Can't show you just yet what it is I'm working on but that isn't the point....it's to remind you how good it feels to be in the moment and make stuff. I was watching L.A. Ink last night and was inspired by Guy, Hannah's brother, and how he designed an edge of a shoulder tattoo (couldn't find you a picture) but it was kinda like the brush I made today to border the photos above. Super cool. On the calendar it says Spring. Even if it might not feel like it where I am, or where you are, it soon will change. Spring brings the promise of re-birth, of budding life, of color....a time to let yourself be motivated to open up and grow. BRING IT ON!! You may have been keeping up with Monica and her amazing community project. If not...where have you been? You can see her posts HERE. This is a woman who has opened her heart, worked her magic, and is still stitching love into an important cause. Bookmark her now so we can blast her with encouraging comments, and keep updated on the Pink Artist Doll and the auction to follow. 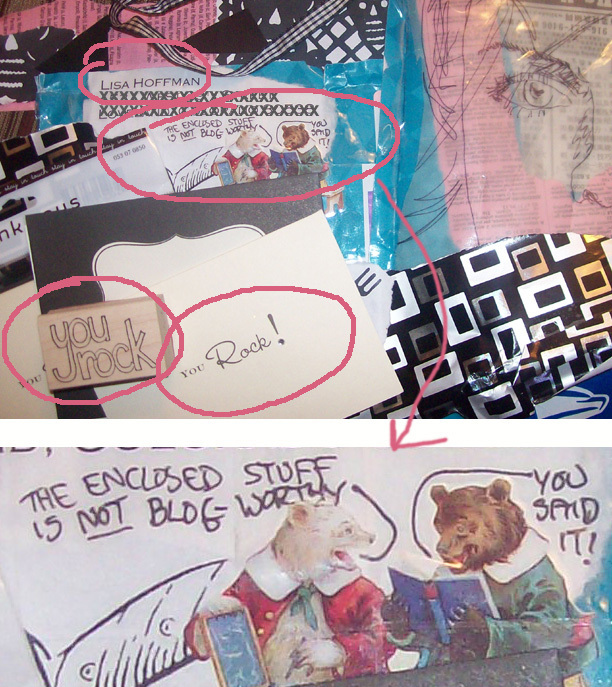 You'll see in the photos below that sweet Lisa didn't think her package was blog-worthy. I am behind on showing you some cool things that have arrived here that I hope to post about soon....but I disagree with Lisa on this one. It's totally blog-worthy because I know you will squee with me when you see the perfect-fit-gifts she sent my way, just to make me smile. I'm off to the airport to pick up my mom. Have a great weekend - and if I don't get back here to post for Easter, have a good one. Save the black jelly beans for me. EDIT: for some reason my blog archives are flukey - and you can't get to them by month. So this is for you Chris: DYEING PAPER post from last year....using up the egg dye on your scrap stash. Test driving my new carvings. 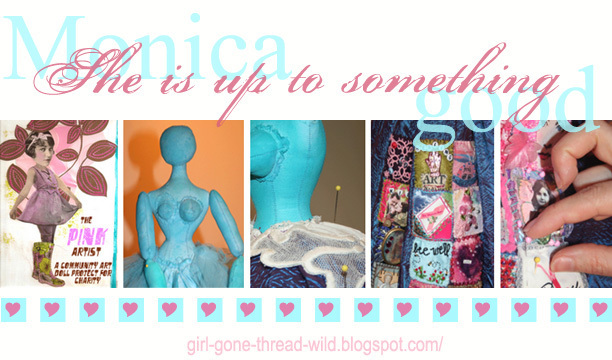 I just looked back at my blog from March 2007....lots of Lucky Girl posts and even a story of where the name Green Pepper Press came from. 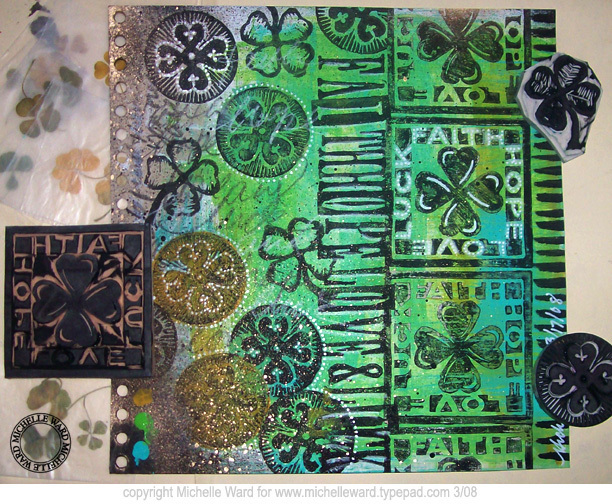 It makes me feel like I'm not showing the spirit this year - but I did carve today because a four leaf clover is one of my favorite images....just don't expect a card from me, I didn't schedule my free time very well. 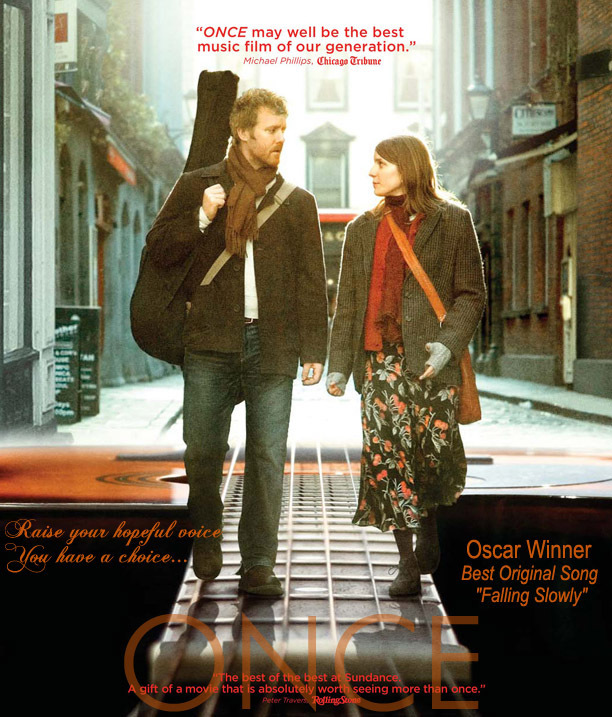 Everyone is Irish today....don't forget to wear your green, and have a lucky one. Cheers! My Aunt Molly sent this....and we say: If you're lucky enough to be Irish, you're lucky enough! * your attention span is so short that---oh, forget it. 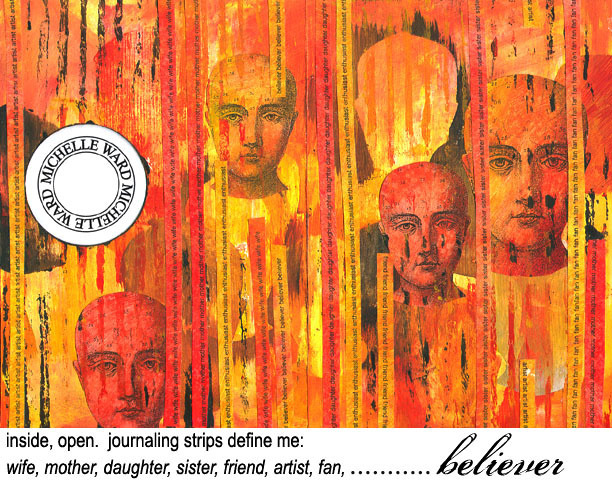 I've been involved in a Self-Portrait collaborative journal exchange - and this is one of the pages I made. I was typing out strips of words that define me....I asked Fallon to come look at the document and tell me if she could think of another word. She said this: Believer. It took my breath away. Believer. She didn't say shopper, or cook (which I'm not but kids don't really know that), or car-pooler, or dweeb, or ..... She said Believer. 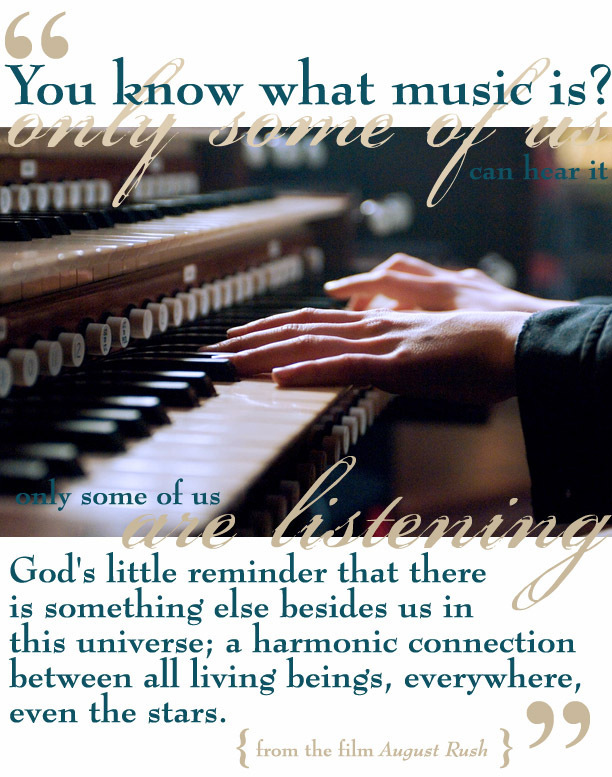 I know she didn't mean it in the religious way, although I am that kind of believer. She meant it in that I believe in people, I believe in friendships, I believe in love, and I believe anyone can make what they want of themselves. Thanks Fallon, I will live up to your definition of me. The original above was for another artist (can't tell who yet). 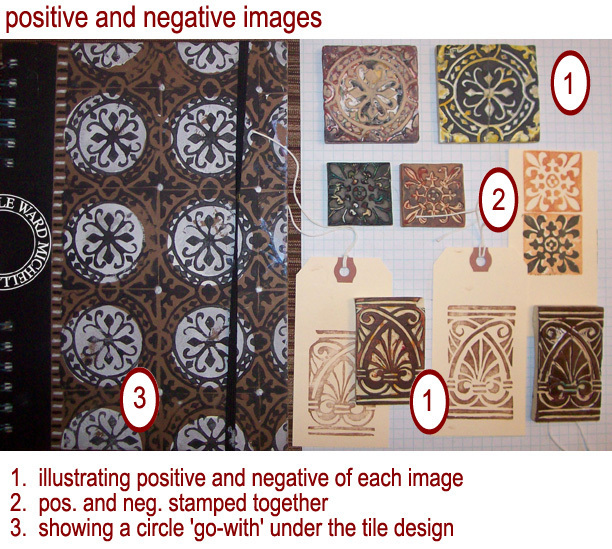 Below are variations done in PS to test additional palettes as I continue on this theme in my own journal. is this running through your head? i've been singing it all day. Sometimes I carve right around the outline of an image that is a shape like the stars in the post below. 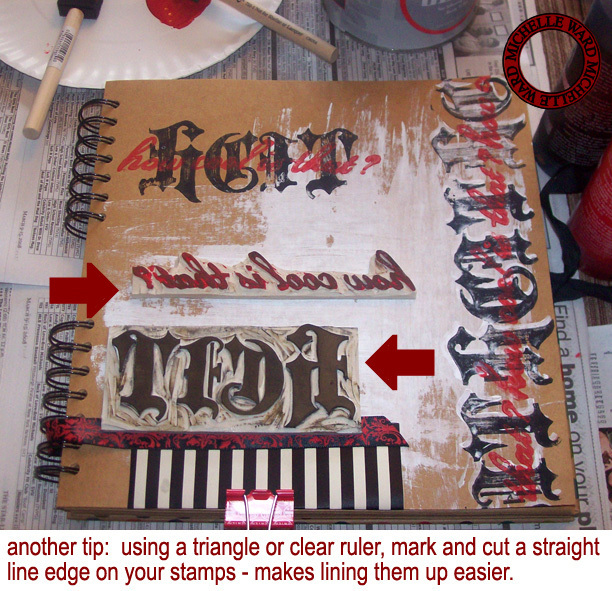 With a word stamp I will often leave at least one straight edge, marked with a gridded clear ruler or triangle so the edge is square with the image. This gives me the opportunity to line up a stamp if I want to. 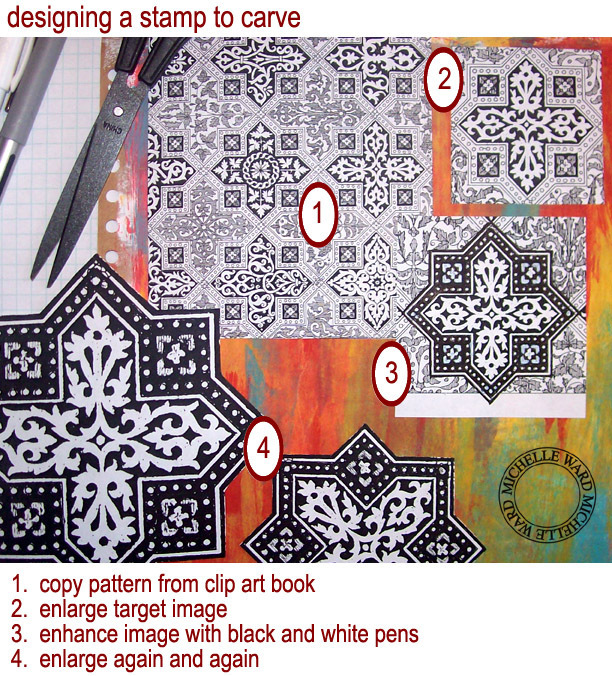 And a few more visuals - when I carve out a crowded area I like to use my exacto. 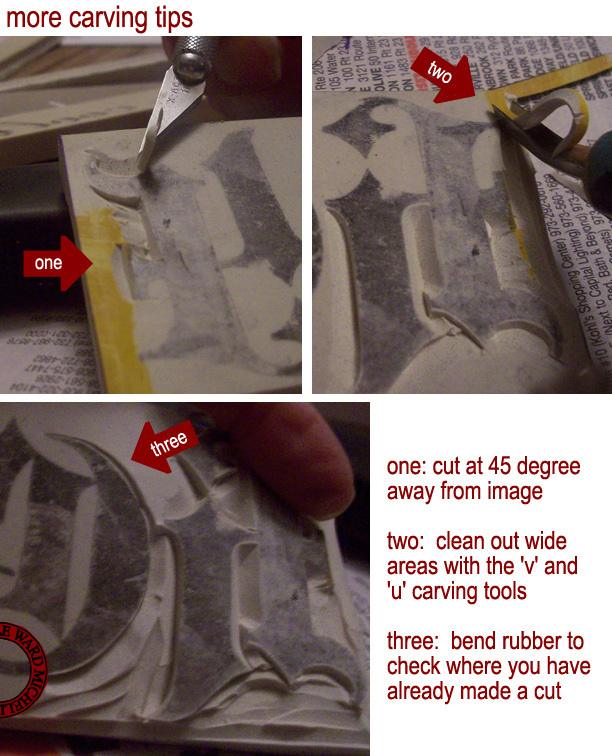 I tend to use the 'V' and 'U' shaped carving tools for cleaning out the blanker areas. I don't always trust myself with the 'V' to make all those curvey cuts. 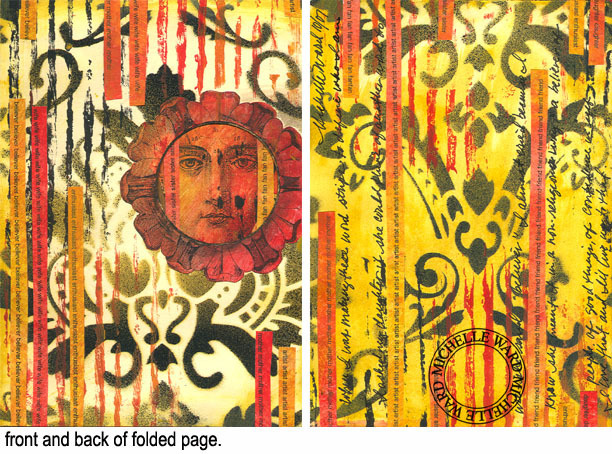 I always cut on the right side of an image - constantly moving the stamp. Often I can't remember if I've cut a line so a bend the stamp a little to see where my lines are. 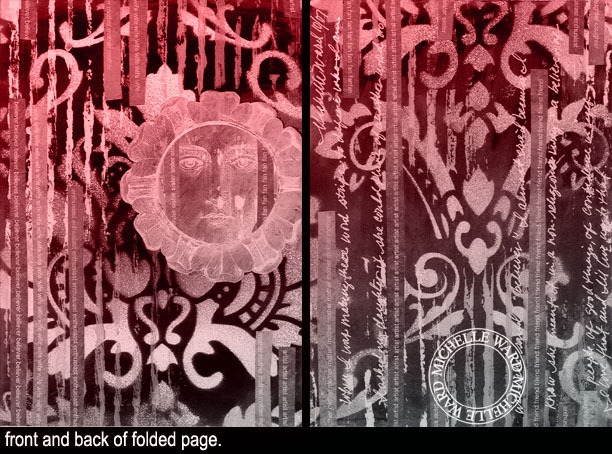 OFF TOPIC: are there any other typepad users who have noticed funky things happening with their photo albums? My thumbnails in the side bar keep changing. They used to all be the same size and from time to time one or more get smaller. I opened a help ticket but haven't heard - was wondering if you had the same thing going on? This month on the GPP Street Team, our Crusade is to cut or carve your own tool - because it's a sure way to keep your art original. You can come see what we are up - several Crusaders have already shared their terrific carvings. See the links posted under Crusade No. 18. 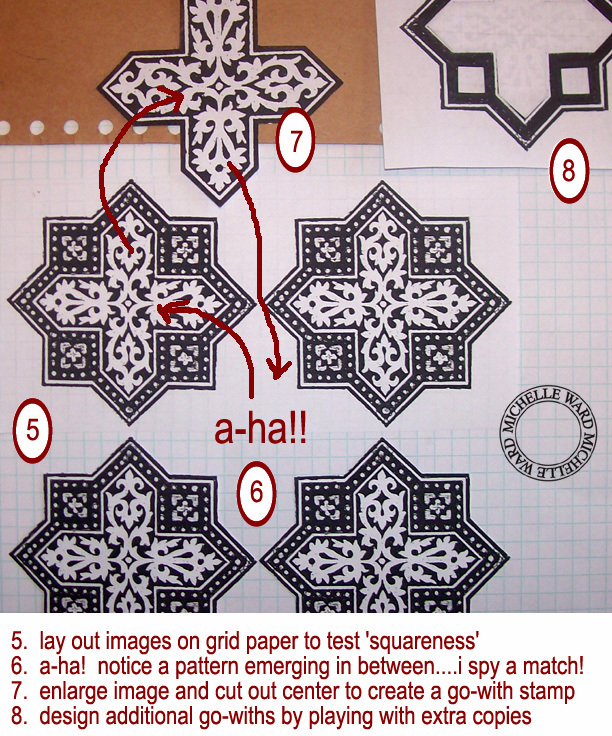 I will review making a stamp now and later this week I'll go over stencil cutting. 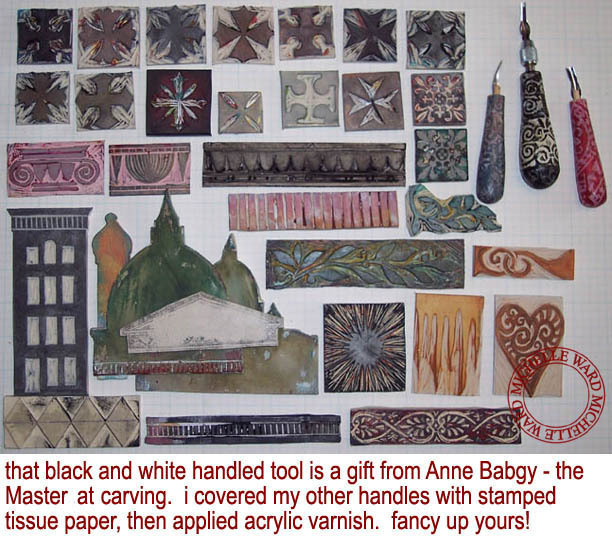 My source for the carving material is from Nasco, HERE. 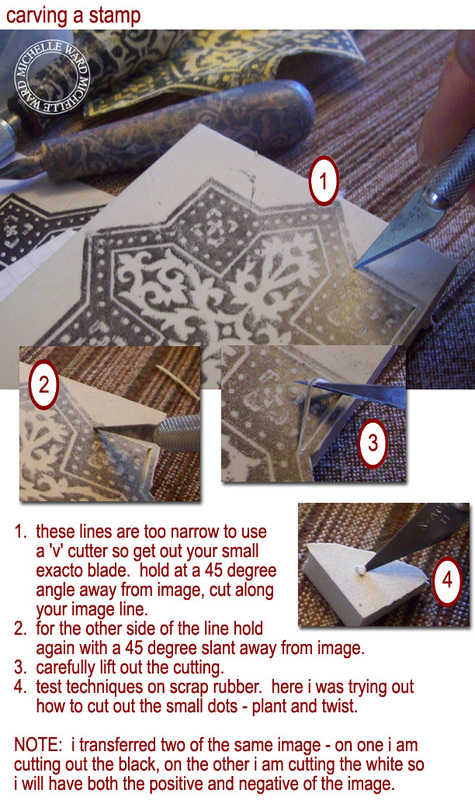 You can get the tools there too, but an exacto cutting blade works too. 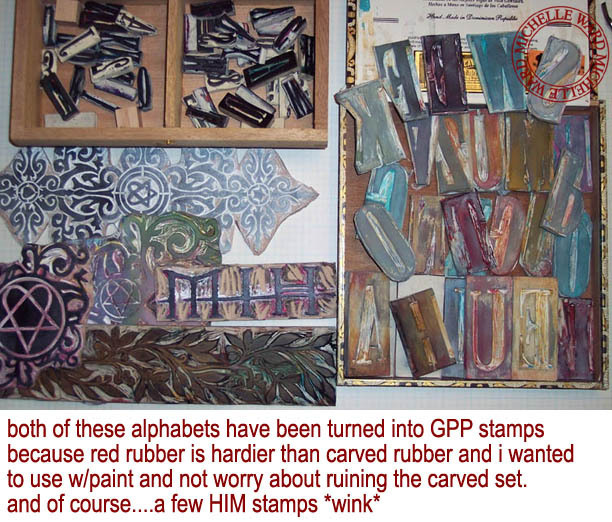 Can't wait to see what you come up with when you carve your own stamps. If you want to share what you've done come play on our street. You know that saying: Do What You Love. It goes hand in hand with Love What You Do. From the same words is What Do You Love. 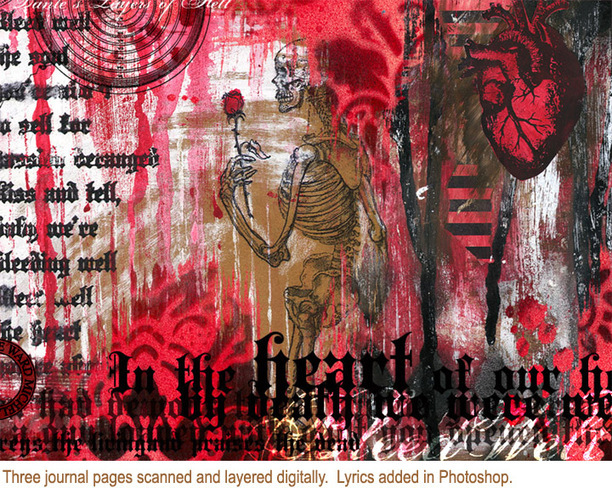 I love making real art, but I'm totally in love with exploring things digitally. As I've said before, I'm self-taught, and I'm still working in PS DS. What's DS you say? It's my comical reference to DinoSaur era. That would be PS 5.5. I have a later version here but I'm reluctant to load it since I nearly passed out and threw in the towel when I made the switch from 5 to 5.5. 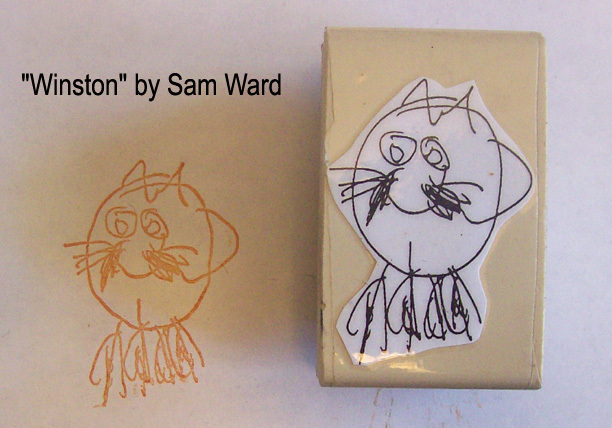 If you've seen the new Stampington publication Somerset Digital Studio (I don't have a copy yet!) you'll see I wrote a tutorial on making custom Photoshop brushes. My apologies to those of you who have left the Dinosaur era and are working in a current version because the steps might not be exactly translatable - but hopefully you'll still gleen some value in my tips. So what's my point today? I guess it would be that having an interest in learning is just plain good. Know what you love, and Do It. I don't know where I'm going with my digital skills but it really doesn't matter - I'm learning many cool things that can be interpreted in my 'real' work, and I've been able to make graphics for myself and others that is not just playtime stuff, it's a paying gig, so that's something. My other point would be that when you know what you love, and can spend time doing it, it doesn't matter why or what for, ya know? In looking back at the evolution of my digital playtime I realized that much of it can be blamed on my favorite band. Yes, that's what I said. I can attribute my growth in developing my digital skills to HIM. If you aren't an avid fan like me, you may not be aware that many bands have message boards. When you participate on a board you have the option of creating an avatar and signature for yourself - graphics of a very small size that show up on your posts. I've made a habit of not only making my own, but offering my services to other online friends on the board. I also participate in the graphics contests that are posted monthly. I can proudly say I won this month for designing a wallpaper below (meant for your computer desktop) and have won honors a few times over the years. 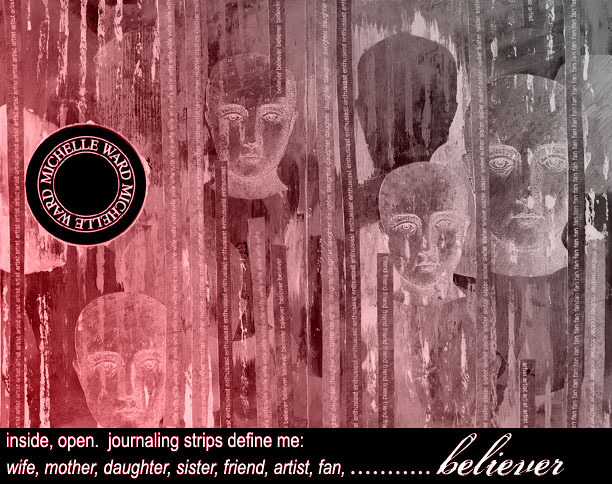 You may recall seeing the journal pages above - this time they have been layered, with text added. I love the combination of real work and applied text. It's a great learning tool that leads to problem solving - like how would I get that text onto my page in the real world? 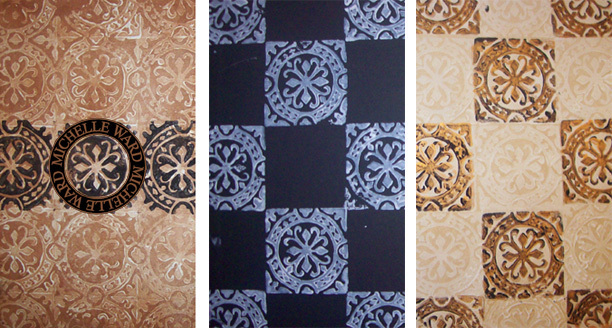 Toner transfer, carved lettering, printed transparency maybe? Below is a partial portfolio of some of my messageboard graphics made for me and some friends, as well as assignments for the monthly contests. It won't look like much to you, but to me it represents the hours of homework learning how to manipulate images and text. The canvases are so tiny you would hardly believe how much time they took - but to me it's time well spent because it got me to where I am now. Know what you love but haven't tried it yet? What are you waiting for? This month we are Cutting It Out on the Street Team. 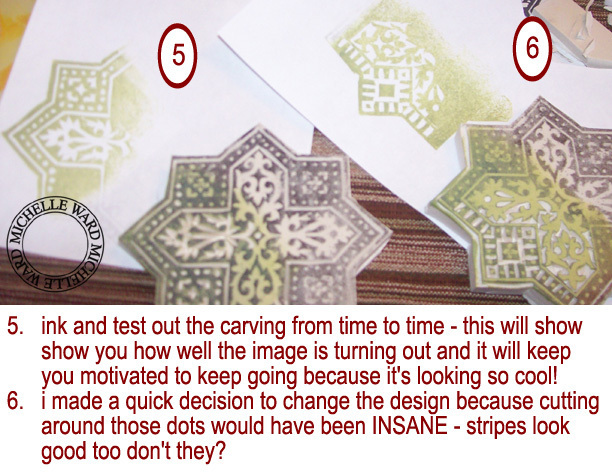 We are carving stamps and cutting stencils and sharing the results. 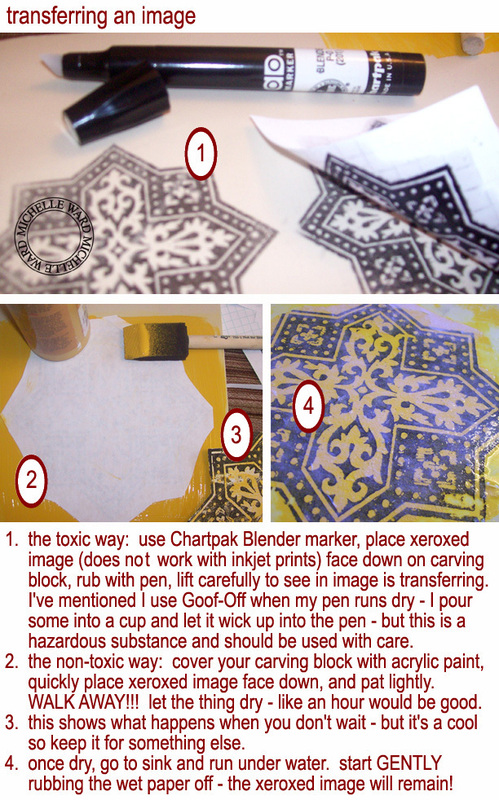 Soon I will post a tutorial on the stencils. 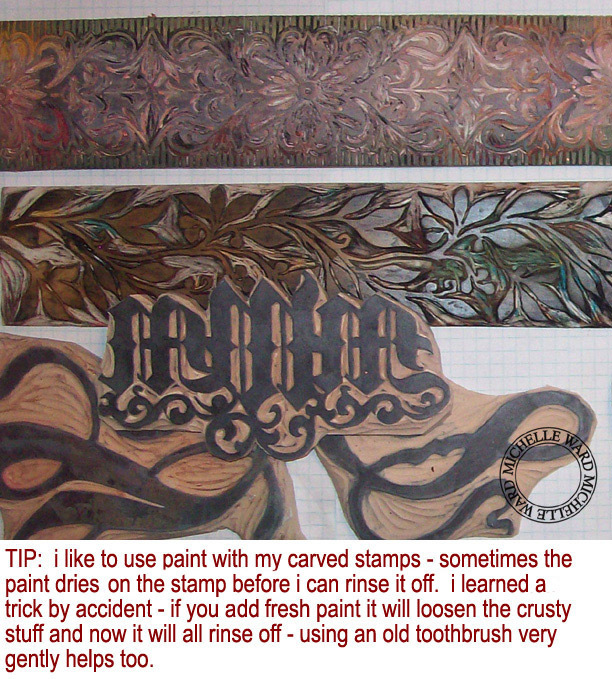 Interested in making a custom stamp? Come play with us on the Street Team. Congrats to Pam McClung who was the Top Hat Pick for the Pandora's Box Crusade!